The Chicago Sky have shown a remarkable level of resilience this season, continually managing to find ways to win with their backs seemingly against the wall. Although the Atlanta Dream and Indiana Fever were in perfect position to eliminate them, the Sky find themselves headed to the 2014 WNBA Finals on the strength of strange fourth quarter shooting efficiency spikes. Shavonte Zellous pretty much summed up the Indiana Fever’s 75-62 loss to the Chicago Sky in Game 3 of the Eastern Conference Finals. The Fever were first in the Eastern Conference in 3-point shooting this season at 34.6% on just under 15 shots per game; they shot just 14.2% (2-for-14) from beyond the arc in Game 3, many of them uncontested. The Fever had 9 turnovers in the first half after averaging nine per game to that point in the playoffs. Highlighting how odd that was, they had just 3 as a team in the second half. They had just 9 assists on 21 made shots (42%); during the season, they had an assisted field goal rate of about 53%. Not to take anything away from the Sky — who played Elena Delle Donne for just 3 minutes in the second half — but taken together, you can legitimately say that the Fever just had a bad night. Maybe the Sky would have won even if the Fever had played better, but this smacks of just being an ill-timed fluke where nothing went right. Held up in contrast to the way the Fever just absolutely dismantled the Sky’s defense when the two teams met in the first round of last year’s playoffs, Game 3 was a shockingly bad outcome for the Fever – it’s just really hard to figure out what happened there. Even more disappointing was that a Game 3 really never should’ve happened. And it wasn’t just one missed box out on that play: when you review the film, it was really three missed box outs. Sky forward Tamera Young just happened to be the one in position to retrieve the Delle Donne’s missed shot when it came off the rim (and Courtney Vandersloot just sort of ran away to let her have it). Doubling Delle Donne on that shot obviously took one defender out of position to rebound, but neither defender got a body on the shooter – Tamika Catchings turned and ran toward the basket while Karima Christmas just stood in place and watched the shot. Shavonte Zellous allowed her assignment — Allie Quigley — to run right by her into the paint as she stood and watched the shot bounce off the rim. It’s hard to tell what exactly Briann January was doing on that play, but she appears to literally step out of Young’s way as she jumped for the rebound, which resulted in the game-tying bucking Dunn lamented. It was just a bizarre play — in what ended up being a sort of bizarre series — from a veteran team that had to realize that just securing the rebound on one possession would have sent them back to the WNBA Finals. And not just any veteran team or even a good one, but a veteran team that had otherwise been dominating the boards the entire game. It’s not that the Fever have typically been a great rebounding team — although Erlana Larkins, who was the only one who tried to box out on that final play, had an outstanding rebounding season — but that’s the kind of purely mental collective lapse that you’d expect from a young team like the Sky not the veteran team that has been there before. And for whatever reason, that same sense of desperation — or the lack thereof for the Fever — just seemed to carry over to Game 3. There really isn’t a rational explanation for why the Sky have made this run to the 2014 WNBA Finals even if it’s obvious how it happened– in a way, they have no business being there at all. There’s not really a good explanation for why two veteran teams now have resisted the urge to finish them off when they seemed to be taking their last gasps of breath. And yet that is the Sky’s story this season: that final possession in regulation in Game 2 and a Game 3 in Indianapolis are scenarios where the balance of mental toughness was supposed to swing in favor of the veteran team. Their meeting with the defending conference champion Atlanta Dream in Game 3 of the first round was headed toward a loss to a more senior team through three quarters until Delle Donne exploded. There was some doubt as to whether the Sky would even make the playoffs until the final week of the season after a year in which they lost countless games to injury. Optimistically, you could say that the Sky are just a stunningly resilient, digging deep to overcome the odds when hope is all they have left. More cynically, they’re living on borrowed time. They head to the Finals appearing to have nine lives, the difference being that this time they’re facing a Phoenix Mercury team that has grown perfectly comfortable with its own killer instinct and just can’t be expected to let the Sky off the hook in those situations. All you can really say is what Dunn and Zellous have already said: the Sky just seem to show a stronger sense of urgency when it counts. And there are numbers that might support that. Further adding to the Fever’s frustration has to be that the Sky really didn’t shoot all that well in either of their wins overall. But the young team continued to be outstanding in the fourth quarter. Final period shooting percentages for the Chicago Sky and their opponents during the 2014 WNBA Playoffs. The Sky have been absolutely torching opponents in the final stages of games in their playoff wins (in fairness, in Game 2 vs. Indiana, both teams shot over 50% but the Sky shot 50% to the Fever’s 12.5% in the final period). 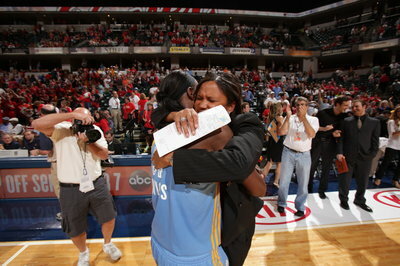 Even in their Game 1 loss to the Fever, the Sky had a 41.2% to 17.6% advantage in shooting efficiency. The more amazing thing about the Eastern Conference Finals was that the Sky didn’t even play that well prior to the fourth quarter in either game: looking at the statistics for Game 2, the Sky were not only getting killed on the boards through three quarters (34-21) but also shooting just 40% to the Fever’s 34.6%. In Game 3, they also got crushed on the boards and were only outshooting the Fever 41.5% – 38.3% through three quarters. Then they just turned it up in the fourth to establish a massive advantage in shooting efficiency that the ice cold Fever had no hope of competing with. 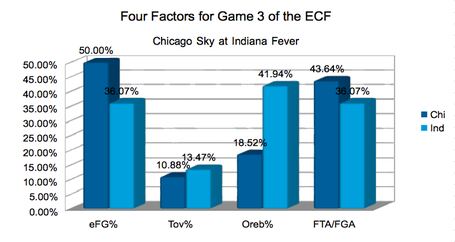 Four Factors statistics for the Chicago Sky and Indiana Fever in Game 3 of the Eastern Conference Finals. There isn’t any really easy strategic explanation for a pattern like that to occur over two series, but the reason for it isn’t necessarily complex either: in every one of the Sky’s big fourth quarters it has been one player carrying them to victory. Game 1 against the Atlanta Dream was mostly a team effort, but ultimately came down to Courtney Vandersloot making a clutch game-winner with under 30 seconds left. Game 3 against Atlanta was all about Delle Donne. And in the Eastern Conference Finals, it was all about Sylvia Fowles showing glimpses of what we’ve all been waiting for her to do in the final periods of games. Allie Quigley was actually the star of Game 3, scoring 7 of her game-high 24 points in the fourth quarter. And really, Courtney Vandersloot deserves credit for continued efficiency with a playoff career-high 9 assists and just 2 turnovers despite a quiet night as a scorer. But Sylvia Fowles absolutely took over in the fourth quarter of both Games 2 & 3 (and also led the team in scoring with 7 points in the fourth quarter in their Game 1 loss) to give the Sky those massive advantages in shooting efficiency. With the way the Fever were shooting in Game 3, the game felt like it was over after three quarters anyway so Fowles’ scoring production wasn’t quite as urgent but that doesn’t negate the fact that she looked dominant in the fourth quarter once again. It has always been the case that when Fowles gets low position, calls for the ball and actually gets the ball, she could overwhelm just about any center in the league with either agility or power – or at least that’s what we’ve always expected from her. She just hasn’t ever looked nearly as assertive in the post as she did in the Eastern Conference Finals when she just bullied the smaller Fever front line. And when teams are forced to direct so much attention to Fowles, that opens things up for the entire offense (this is probably the first building block for any preview of the 2014 WNBA Finals). And therein lies the strength of the Sky and the key to their resilience during the playoffs: they’ve managed to find someone to carry the load when it counts. And they have so many weapons to rely — all of which have taken over games at times — that it’s almost starting to seem like by the fourth quarter they’re just stubbornly exploiting whatever advantage they feel most comfortable with in the moment. Although the teamwork doesn’t always look as beautiful as it does for, say, the Minnesota Lynx, the more subtle strength they’ve shown is a willingness to defer to the teammate who gives them the best shot at winning in a given circumstance. You don’t shoot that well in fourth quarters without some awareness of the optimal shot distribution given the matchup. Perhaps we don’t want to say they’re “egoless” they have the tendencies of an egoless teams, which might be the byproduct of having two MVP-caliber stars and a point guard who are quiet leaders as opposed to the louder, centerstage types. We still don’t entirely know much about this Sky team — that has still only been at full strength for about one game all playoffs — but we’re just starting to find out how potent they can be. And whatever else is said about them, we can put their future in perspective by saying that being far less than 100% this season has gotten them to the WNBA Finals. For more on this series, check out our Fever vs. Sky storystream.